November brings Autumn colours, falling leaves, Remembrance Week and the run-up to Christmas. 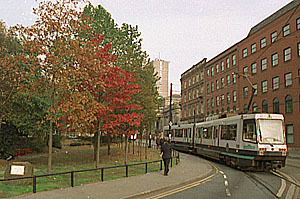 See Eyewitness in Manchester Issue 8 (8 March 1997) for the same scenes 8 months ago. 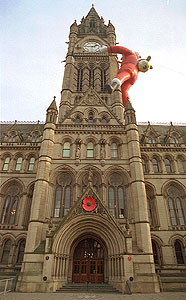 This is the last time that this particular inflatable Santa will be hoisted onto the Town Hall clock tower. A great weight has been lifted from the shoulders of many people here and around the world, with the news of Judge Hiller Zobel's decision this evening to free Louise Woodward. I heard his announcement live on the BBC local radio station, GMR (Greater Manchester Radio). The Boston radio station WRKO are guests there this week, and will be presenting their morning show live from Manchester. The supporters of Louise Woodward in her home village of Elton held a day of action on Saturday, with a bonfire and firework display on Saturday night. At the time, it was thought unlikely that Louise would be released. There will be rejoicing this evening in Elton, but let's not forget the Eappens, the death of whose child sparked off this whole business, which now, hopefully, is almost at an end. Meanwhile, Manchester City plumbed the depths of despair after losing 1 - 0 to bottom-of-the-1st-division Huddersfield, the team they beat 10-1 exactly ten years ago. Fans gathered in protest outside the ground after the match on Friday, and threw fireworks at police horses: "It's the worst side I've seen for twenty years" seemed to be the unanimous verdict. I would like to introduce a parallel "Manchester Sports Newsletter" compiled by someone qualified to write about this subject. If you know of anyone who could do this, let me know. Beleaguered ex-Tatton MP, Neil Hamilton pleaded his innocence in the Commons this week of accepting cash for questions. Unfortunately for him, the committee once again decided against him, but failed to prove conclusively that he was guilty of the "cash-for-questions" charge. They said his behaviour "fell well below" the standards expected of an MP, whatever than means. Mr Hamilton, whose career has been ruined by the accusations, was extremely dissatisfied at the inconclusiveness of the outcome, and will be having private talks with his erstwhile opponent Martin Bell, now the MP for Tatton. And today (Monday) came the news that William Hague has ordered that Neil Hamilton should be barred from ever standing as a Conservative MP again. The Central Library may not be the first place you'd think of to spend an all-nighter, but to celebrate National Library Week, the building remained open from 5pm to 8am the next morning. 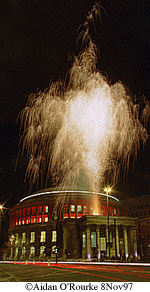 At 6.30 pm, special floodlighting was switched on, and there was a magnificent firework display. The building was open all night, with puppet shows, guided tours through the (allegedly haunted) stacks, jazz music, theatre performances, poetry readings and a chance to surf the Internet. The weather has been mostly overcast, but mild this week, with temperatures in the 50's fahrenheit, around 11 or 12 degrees celsius. An area of low pressure has been covering the whole country, causing the unsettled weather. Today there was a mixture of sunshine and rain, and colder temperatures. 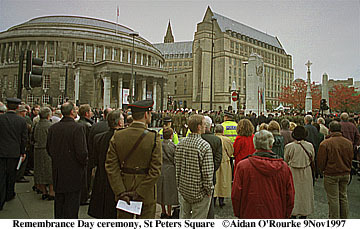 Remembrance Day was celebrated on St Peter's Square yesterday. As ever there was a large turnout. A minute's silence was held at 11pm, in line with the rest of the country. What a contrast from 14 hours before. Another period of two minutes silence will be observed tomorrow. People have been complaining to local newspapers about the delinquent behaviour of youths in the Clayton area. They had the same problem there 50 years ago. Read about it in Manchester Eyewitness 1947, which will shortly be appearing weekly in the Manchester Evening News. Haven't heard any problems with laser pens (laser pointers?) here in Denver. Got one for myself a month or so ago for $9.95. Used it a lot for a few days and now it just sits in my desk drawer. There was a major problem with laser light displays in Las Vegas NV. The major hotels had strong laser lights, shooting off from their roofs and it caused problems with air liners landing at the local field. They have either stopped using the lasers or lowered the power input, don't know for sure. 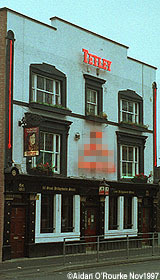 The pub featured above is of course the Peveril of the Peak, located on Chepstow Street, behind the Bridgewater Hall. Congratulations to D. Melia, (u5dm2@csc.liv.ac.uk) and JBran76657@aol.com! The pub below is not far from the Peveril of the Peak, actually, and has a very... patriotic name. Do you recognise it? E-mail with the answer. Monday: Judge Hiller announces his decision (not on the Internet!) - a manslaughter charge, and immediate release for Louise Woodward!